After a few false starts, I've worked my way through the back panel and am now starting on the collar on the first front panel. Yahoo!!! Thanks for letting me join the KAL! I just started the Nantucket and although I had a few hiccups at the beginning (then I remembered how to count!) I'm finally on my way and working on the first decreases, using Patons Classic Merino and my gauge was right-on. That said, I found that when I cast on for "my size," it was coming out HUGE... So I cast on again with size 8's and a number of stitches of my own between 2 sizes. It's great to see all of the other Nantuckets out there! Thank you for letting me join. I joined back in February and haven't posted yet. Here is my progress this far. The right front was cast off last night. 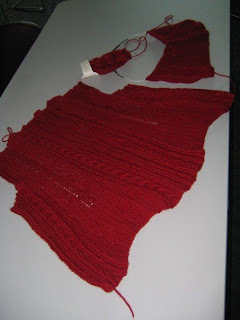 I am using the Berroco yarn the pattern calls for in Sapling. This is my first adult sweater and I am enjoying the pattern very much. Turks & Caicos Islands in the British West Indies. We spent a week there and I did not get to knit a lot, but made some decent headway knitting on the beach, in fact I will post a photo of my heaven, the beach, a beer and my knitting. Although once I got on the plane the woman next to me was knitting with, yes you guessed it, metal circular needles. And another guy we were with had two lighters. geesh. I guess they had it in for me. By the time I got to my second to last stop I picked up another pair of needles, sure hope I got the right size, I think they were 3's.........dang..........all those wasted hours on the airplane. So beware, BWI is not nice to knitters. I've been knitting for about a year and have discovered that I like to knit more and more complicated patterns and learn new techniques with each project. This one should be quite a challenge! Here's my Nantucket back up to the second bust increase. So far, I'm in love. I can be fickle, tho, so we'll see how long it lasts.